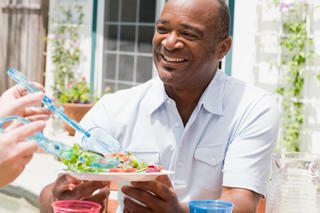 Men with prostate cancer are being advised to take a look at their diet as it could affect health outcomes. There are certain medical conditions and unfavourable outcomes that are entirely unavoidable, with the best that people can do to safeguard against these being to have as healthy a lifestyle as possible. Now, however, it has been suggested that a low-fat diet and taking fish oil supplements could prove beneficial to men who have prostate cancer, after University of California, Los Angeles research showed that those who abided by both presented diminished levels of pro-inflammatory substances in their blood and a lower cell cycle progression (CCP) score - the latter used to predict cancer recurrence. "We found that CCP scores were significantly lower in the prostate cancer in men who consumed the low-fat fish oil diet as compare to men who followed a higher fat Western diet," summarised Dr William Aronson, clinical professor of urology at the UCLA and chief of urologic oncology at the West Los Angeles Veterans Affairs Medical Center. According to the expert, the CPP score for prostate cancer is linked to how aggressive a particular form of the disease may be, meaning it can be used to predict which cases may recur. He added: "We also found that men on the low-fat fish oil diet had reduced blood levels of pro-inflammatory substances that have been associated with cancer." The substance monitored for this part of the investigation was leukotriene B4 - also known as LTB4. For the purposes of the study, a Western diet was one for which 40 per cent of the calorific intake came from fat. What's more, this fat was typical of a Western diet, with high levels of omega-6 fatty acids - contained in corn oil - as opposed to the healthier omega-3 fatty acids found in fish oils. The low-fat diet comprised of 15 per cent of its calories from fat, with the participants on fish oil supplements taking three one gram capsules with their breakfast and two with supper. Published in Cancer Prevention Research, the results build upon those from a study previously carried out by Dr Aronson in 2011, which revealed that a low-fat diet complemented with fish oil supplements eaten for four to six weeks before an operation to have the gland removed actually slowed down the growth of cancerous cells. It also showed that those who had been on the healthier, supplemented diet presented altered cell membrane composition of both healthy and cancerous cells in the prostate gland. "These studies are showing that, in men with prostate cancer, you really are what you eat," the study leader said. "The studies suggest that by altering the diet, we may favorably affect the biology of prostate cancer." Another way for both men and women to improve their diet might be to enhance it with nutritional supplements, to ensure they are getting the right amounts of all of the essential vitamins and minerals the body needs. Biobran MGN3 - available from the Really Healthy Company - might be the perfect dietary support, as one of the most effective food supplements of its kind for maintaining a healthy and strong immune system. The complex is GMO-free, non-toxic and highly absorbable. What's more, its efficacy does not lapse over time, meaning that it can be taken over a long duration without any decrease in its effectiveness.